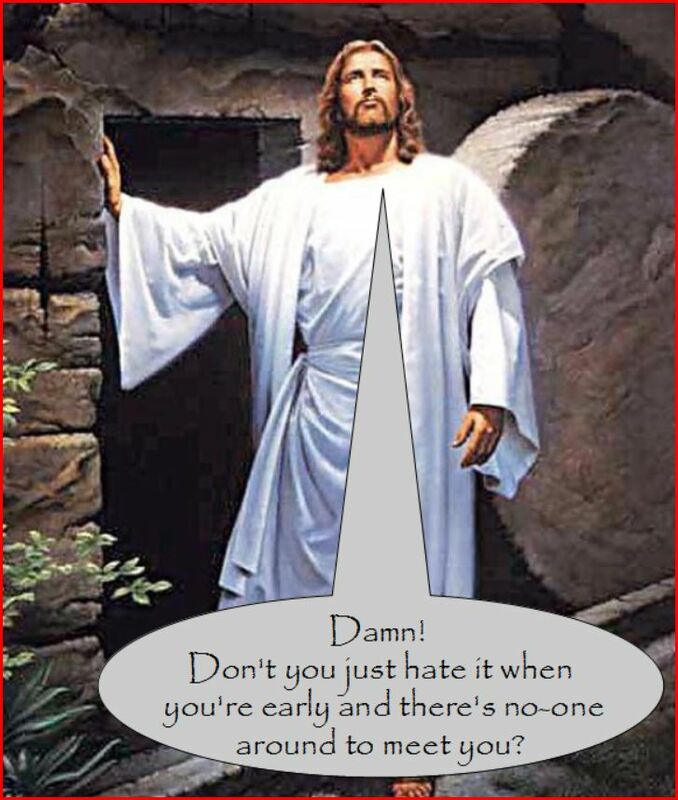 How long was Jesus in the tomb before he ‘rose again’? Three days you say? Wrong! Read on and discover the secret of the Great Resurrection Miscalculation. the Son of Man will be handed over to the chief priests and the scribes, and they will condemn him to death; then they will hand him over to the Gentiles; they will mock him, and spit upon him, and flog him, and kill him; and after three days he will rise again. On the surface, this seems pretty accurate for a prediction of events made some time before they actually happen (it wouldn’t be a prediction otherwise). Except, of course, this prophecy, like others of Jesus’, was written forty years or more after the event. Even then, Mark or whoever wrote the earliest gospel, can’t get it right. He tells us clearly in Mark 15.34 that Jesus dies at 3pm on Friday; Matthew and Luke agree. Jesus then reappears, fully recharged, ‘very early’ on the Sunday morning (Mark 16.2). But 3pm Friday to the ‘very early’ hours of Sunday is less than 48 hours – not three days, not even two. What is the cause of this failed prophecy? For some reason, Mark assumes that ‘on the third day’, when he believed Jesus rose from the dead, means the same as ‘after three days’, the words he has Jesus prophesy. The third day after the crucifixion would indeed be the Sunday, but it wouldn’t be, and isn’t, three full days after it, as Mark’s Jesus seems to think. Thanks to Jesus’ insistence in Mark and Matthew that he would spend three days in the tomb, the belief that he must have done so – contrary to the ‘evidence’ in those same accounts that it was less than two – appears to have become securely established by the time of the fourth gospel. Its writers, however, find their own unique way round the problem. Their thinking seems to have been along the lines that ‘if Jesus said he was going to be buried for three days and three nights, then he must have been. He was the Son of God after all, and he wouldn’t get a thing like this wrong. Therefore, if, as we know, he rose on the Sunday, he cannot have been crucified on the Friday. He must have died on the Thursday’. And so the writers of John’s gospel shift the crucifixion back a day, to around noon on Thursday (John 19.14). It’s an ingenious solution. Thursday to Sunday – near enough three whole days. There’s even some neat symbolism as a bonus: the earlier execution equates with the slaughter of the sacrificial lambs on the Thursday, ready for that evening’s Passover. Problem more than solved! Except it creates a whole raft of new ones, not least the glaring inconsistency between the synoptic gospels’ accounts of the crucifixion on the Friday – after Jesus’ and the disciples’ celebration of Passover the previous evening – and John’s gospel’s account of the crucifixion during Thursday afternoon, well before the Passover meal would have been eaten. Significantly, no-one in the history of Christendom has ever been persuaded by John’s Thursday crucifixion, otherwise we’d remember it on ‘Good Thursday’ instead of ‘Good Friday’, and have a different day off work. iv) because the Bible cannot get its own faked, after-the-supposed-event prophecies right it can’t possibly be trusted about other claims it makes. 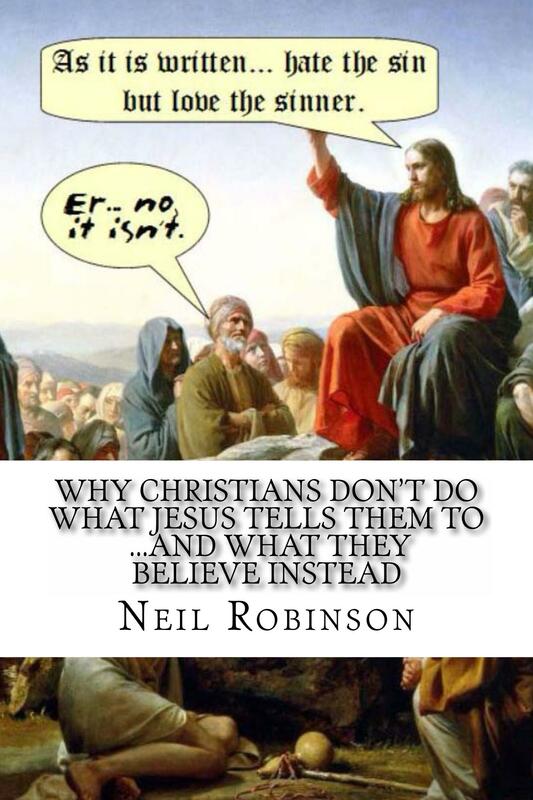 Adapted from my book Why Christians Don’t Do What Jesus Tells Them To …And What They Believe Instead. Buy it on Amazon UK or Amazon US.